Fiesta, made by Homer Laughlin China Company, was the company’s most successful line of dinnerware. It was conceived by Frederick Hurten Rhead, who was hired by the company as the head designer in the late 1920s. Rhead, who was born into an English family of highly regarded ceramicists, had previously worked for both Weller Pottery and Roseville Pottery before joining Homer Laughlin. He actively worked on innovating new shapes and glazes as part of his work, and Fiesta was one of his crowning achievements. 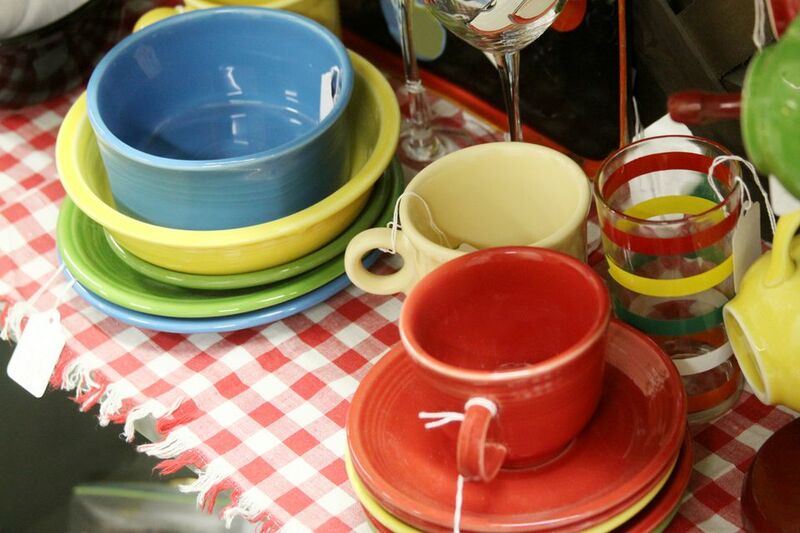 The dinnerware line was introduced at the Pottery and Glassware Show in Pittsburgh, Pennsylvania in January 1936. Homer Laughlin launched an enthusiastic Fiesta advertising campaign that ran from 1939 to 1943 introducing the dish line to many American homes. It’s also interesting to note that red-colored Fiesta was removed from the line in 1943 due to some of the chemicals used to produce the glaze being funneled to bomb production during World War II. A number of Fiesta colors were added over the years in production (see below) until the pattern was discontinued by Homer Laughlin in 1972. Prompted by increasing collector demand, it was revived in 1986 with a new color palette, and it is still available today in major department stores. From the time of introduction through the early 1970s, Fiesta was made in 14 different colors for the regular lines. Special promotions occasionally included other colors. They can often be used to date Fiesta pieces since certain hues were produced for very limited periods. Of all the original Fiesta colors, medium green is often considered the most expensive and the hardest to locate in a wide variety of different pieces. Red is the most controversial, with unfounded reports of it being radioactive and unsafe to use for food consumption due to high lead content. Other trendy colors produced from 1969 to 1972 were antique gold (dark butterscotch), mango red (same as original red and made only 1970 to 1972), and turf green (olive in color). A variety of new colors have been introduced since 1986 when the line went back into production and many of these are still available today. New Fiesta colors, as noted above, were added over time and others were retired. For instance, three of the original colors – light green, cobalt blue, and ivory – were retired in 1951. The 1969 redesign saw the introduction of antique gold and turf green, which were only in production through 1972. Some Fiesta colors were made throughout production and similar ones are still being made today. The hue of a piece may be the first indicator of age but it’s usually necessary to look at secondary clues to make sure your Fiesta is old. New Fiesta pieces have two-letter codes ranging from AA beginning in 1985 through ZZ used in 2011 incorporated into the mark, which helps to identify the newer pieces more readily. It is also important to remember that not all older Fiesta was marked. On some pieces like juice tumblers, salt and pepper sets, and demitasse cups there wasn’t enough space on the base for the standard mark. In other instances, ashtrays, egg cups, onion soup bowls, and compotes have been found in both marked and unmarked versions. The distinctive shapes can help you to recognize these unbranded pieces, so studying up before you hit the flea market will help you avoid overlooking a great addition to a Fiesta collection. How Do I Know If My Antique Is a Reproduction? How is Weller Pottery Marked? Is It Dangerous to Serve Food on Old Dinnerware?